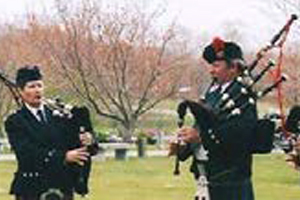 When a traditional funeral service is preferred, you want an experienced professional. 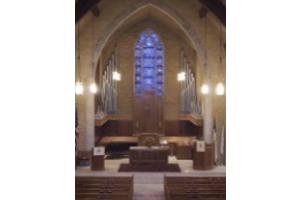 We have relationships with area clergy and funeral facilitators, and if desired, can put you in touch with someone with understanding about what you are going through, and how you might like to personalize the service. Services may be religious, secular, or spiritual, but should always reflect your loved one. We strive to make this event meaningful to your beliefs & traditions as well as making it in accordance with your desires. Helping you make this ceremony everything you want it to be is crucial for us. Visitation is an event that enables family and friends the opportunity to express sympathy and to share memories with the family of the deceased, as well as the opportunity to say your own goodbyes. Visitations are for the living, enabling the bereaved to receive the support of friends and family immediately following the death. Our comfortable and attractive facilities offer you the opportunity to meet in an environment that enhances this difficult yet meaningful experience, whether in a large or an intimate setting. Whatever your choice regarding your loved one’s final resting place, we can assist you. 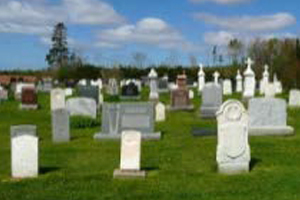 Our sensitive staff will guide you--whether you already have a cemetery plot, or if you need to select a cemetery. There are many choices available to you; and we will support you as you decide what would be appropriate for your family. 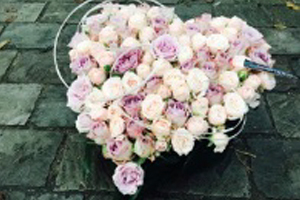 For a unique tribute and a distinctive acknowledgement of your loved one, let us put you in touch with someone who can custom design an exclusive floral arrangement. We have the greatest respect and appreciation for our men and women in uniform. 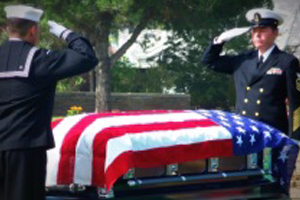 We believe these brave individuals deserve only the best and we show our gratitude by offering custom funerals with military honors, military headstones, burial flags given to the spouse or family and other appropriate privileges. For those who would like to be buried in a national cemetery, we can help make those arrangements. Having served many military families, we can assist you with the necessary steps to ensure you get all of the benefits you deserve. We offer families the opportunity to create their own personalized caskets. 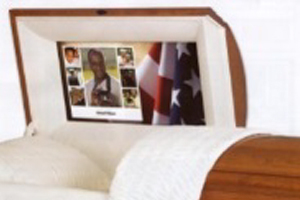 From decorative casket corners, custom cap panel inserts and custom casket interior embroidery we can create a casket that reflects your loved ones interests and hobbies. In times of sorrow, funeral music can say what the heart finds no words for. During the service, favorite songs of your loved one may be played, interspersed between eulogies and scripture readings. These may include favorite popular songs, or music that reflects a tradition or a specific culture. Let us assist you in arranging that special musical touch. The object of a photo board is to celebrate the life of the deceased, and is best accomplished by gathering photographs and memorabilia that will bring the memory of the person to mind for each visitor who pays his respects at the funeral home. 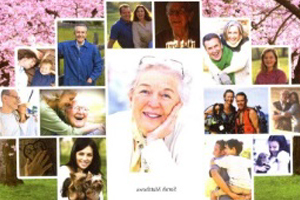 With some deep thought and insight, which we can provide, you can make a photo memory board that will live in the memories of all who come to celebrate the deceased's life. Memorial tables are tables devoted to remembering and honoring a loved one. 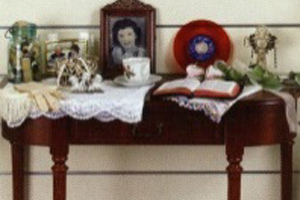 The most important part of the memorial table is a photograph of the loved one. It can also hold flowers and candles, and often displays personal or important items, such as awards, medals and items that held special meaning for the person it represents. 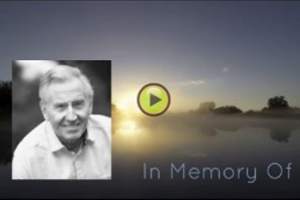 A video tribute can honor your loved one with a personalized and heartfelt digital memoir that celebrates their lifetime. We would be happy to help you create a permanent visual history that can be the highlight of the visitation time. Video tributes are becoming an increasingly common practice, and provide a meaningful way to remember and to celebrate a life. We provide a wide range of printing services, including service folders, prayer cards, acknowledgement cards and register books. 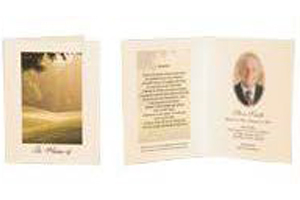 These printed documents pay tribute to the life and memory of your loved one and provide a lasting memorial expressing your thanks to those who are part of the service. We can personalize and look after all the details for your printing needs. 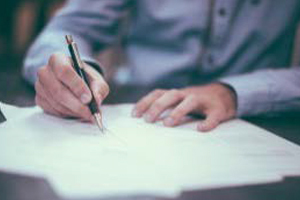 We offer no-cost notary services to those families who need this assistance with any legal or insurance claim documents. It’s just one more way we can ease the difficult time after the death of a loved one. 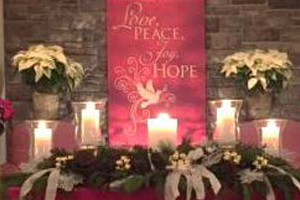 On the first Saturday of every December, Carpenter-Jenks Funeral Home & Crematory holds a special Time of Remembrance. We invite all the families whose loved ones were entrusted to our care throughout the year to come back for an ecumenical service of candle lighting, music and uplifting messages of hope to help families cope with that most difficult first holiday season. Each family is given a personalized memento to take home. Following the service families hang an ornament provided by us on our memorial tree which stands in remembrance through New Year’s Day. Refreshments and fellowship with others who have also experienced loss are a helpful way to usher in that first holiday season.